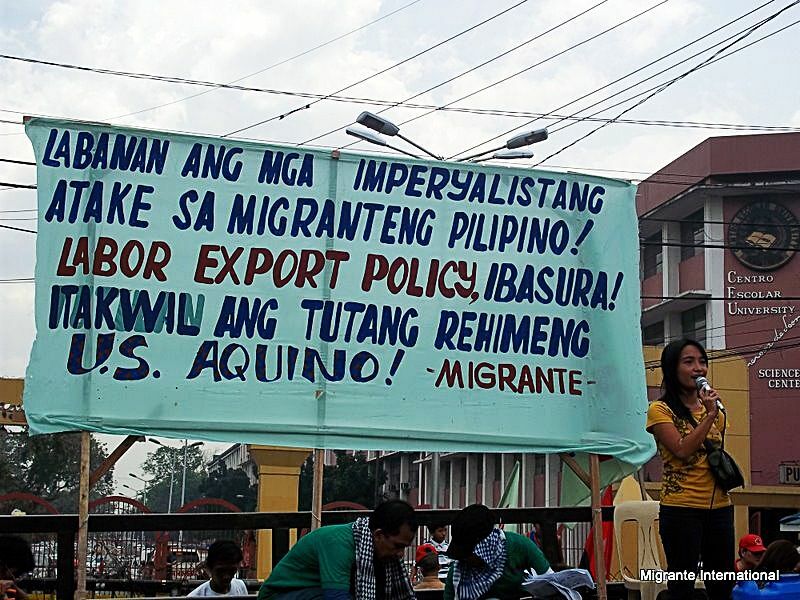 Global alliance of overseas FilipinosMigrante International today slammed US military intervention in Iraq andLibya, saying that the US government’s continuous vested interest in the MiddleEast-North Africa (MENA) region is the real cause of the unending conflicts inthe said countries. The Department of Foreign Affairs (DFA) recentlyraised the crisis alert in Iraq and Libya to Alert Level 3, or voluntaryrepatriation for overseas Filipino workers (OFWs). Alert Level 3 also means theimposition of a total deployment ban of OFWs to Iraq and Libya. The PH government first enforced a totalban to Iraq in 2003 during the Gulf War. In 2004, Iraqi insurgents fighting theUS-led overthrow of Saddam Hussein kidnapped OFW Angelo dela Cruz and condemnedthen Pres. Arroyo’s support for the US. In 2011, the total ban was partiallylifted to allow the deployment of OFWs particularly in US military bases.Another total ban was imposed in 2012, and it was only last year that the totalban was lifted allowing the processing of job orders from Iraq. There arecurrently approximately 10,000 OFWs in Iraq. “Dela Cruz had said then that theconflict in Iraq will not simply end because what the Iraqis want is for UStroops to leave. The situation is still the same now. Since the overthrow ofHussein and the installation of a US-backed government, violence in Iraq haserupted time and again. For as long as the US government refuses to leave Iraqto fend for its own, conflict in the region will not end. The most recentIran-Iraq conflict is a civil war waiting to happen, with the US government atits helm,” said Garry Martinez, Migrante International chairperson. Iran is a staunch ally of the US. USPres. Barrack Obama had already hinted of a possible military action targetingIraq to support Iran. Presently, the US aircraft carrier USS George H.W. Bushand its stike group have been spotted in the Arabian Sea, presumably waiting toact on Obama’s orders. Meanwhile, Libya, where an estimated13,122 OFWs are located, has largely remained in conflict after rebels whoousted Pres. Moammar Gadhafi later formed militias. At the height of the Libyacivil war in 2011, the US government was accused of funding terrorists to sowviolence and conflict in the country. Libya’s Gadhafi was a knownanti-imperialist leader and Libya has always been close to Russia, US’ rival. Martinez also called on the PHgovernment to bare its plans for a possible massive repatriation of OFWs fromIraq and Libya should the situation in the region escalate. “Welfare and protection for our OFWs inconflict situations is a life-and-death situation, it should not just be merePR. Our OFWs will continue to be in precarious conditions in these countriesdue to US interventionist wars to protect their vested interests, and Aquino’s doggedsupport for the US continue to place our OFWs in dangerous situations. ” hesaid.